Please be advised that the playground in Bohn Park will be closed on Wednesday, 4/20, and Thursday, 4/21, due to construction within the area. Street sweeping will take place from Monday, April 25, through Friday, April 29. The heavy construction portion of the St. Vrain Creek Restoration Project is anticipated to be complete by Friday, April 22. This portion of the project implemented an improved design of the creek, for overall greater resiliency, increased flood-carrying capacity, and a healthier ecosystem. In early April, over a thousand willow stakes were planted along the banks. At this stage, the young willows are extremely vulnerable to damage - please allow time for the habitat to establish, by limiting activities in these environmentally sensitive areas. Due to heavy snow over the weekend, the curb, gutter and asphalt removal has been postponed until the week of April 25. However, crews continue to work on drainage and wiring the traffic signal, throughout this week. Work for the Confluence Area Capital Improvement Project has hit an unexpected slowdown, as the remaining construction requires Xcel to relocate gas lines. Xcel has not given the Town an timeline, though staff anticipates movement within the next 1-3 weeks. 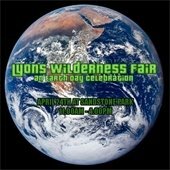 Join family, friends and visitors for a celebration of the Lyons area’s sustainability efforts and the green businesses and community organizations! 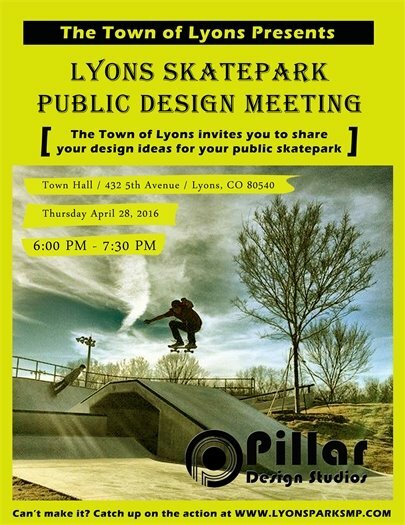 The Lyons Volunteers are seeking help for this exciting event! Various shifts are available. Visit vols.pt/XeP5Xh to sign up. What: The Heartsaver CPR AED Course teaches lay rescuers (a person without medical training) to effectively recognize and treat adult, child, and infant victims in cardiac arrest, as well as how to relieve choking. The course teaches skills with American Heart Association’s research-proven hands-on technique, which allows the instructors to observe the students, provide feedback and guide the students learning of the skills. Upon completion of this course, students receive an American Heart Association Heartsaver CPR AED Course Completion Card that is valid for two years. Who: Anyone who is a Lyons citizen can take the course. There are no prerequisites. Questions: Please call 303-823-6611 and leave a message in the chief’s mailbox and someone will return your call. Please register soon, as class will fill up quickly. Class is limited to 20 students and will be filled on a first come first serve basis. The American Lung Association in Colorado is fighting for cleaner air by providing $900,000 in vouchers to help replace or retrofit old wood and coal stove appliances with new, efficient, EPA-certified appliances. Residents and businesses of Boulder county that use older wood or coal burning heating appliances for primary or significant heat are eligible for a voucher of $400 - $3,000, depending on the type of replacement appliance and income level. Vouchers in the amount of $3,000 will be available for low-income residents in the counties listed above.